I've been translating subtitles for online video content in collaboration with MediaWen for a number of years now and have also used the Amara platform for my pro bono work with TED. The experience is very different from translating standard text documents, because there are far more constraints - particularly in terms of register (the speaker's voice) and character-number limitations. Even so, I find subtitling makes a refreshing change. It's interesting having to make all the parameters work together, and the timescale is usually short - in terms of both deadline and the amount of time spent on the project. 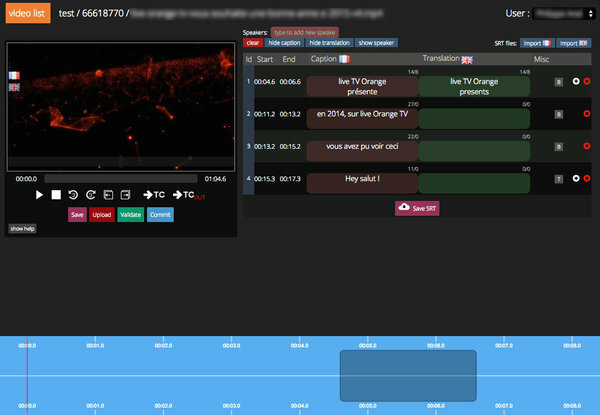 The online management platform for closed captioning, subtitling and automated dubbing developed by MediaWen is well-designed and a real pleasure to work in, so that a short video can be done and dusted in an hour or two - including proofreading - and I find it very satisfying to see my work on-screen and then online, almost immediately.